Chickweed’s other name is Stellaria. I think of the tiny “stellar” white flowers that adorn its greenery in springtime. Its tiny stems are succulent in nature and should be rested for a day or so after harvesting to decrease water in the stems- especially if you want to make an infused oil for salve. Tommie Bass use to say that Chickweed “took the weight right off.” Chickweed is a useful diuretic and stimulates the kidneys to remove excess water, so in a way it does remove weight. In that regard, he recommended Chickweed tea or tincture. An excellent source of vitamins and minerals, Chickweed is one of the great spring tonics. It is rather tasty piled on a sandwich and makes a great green smoothie. Spring tonics can be fun! Chickweed is quite healing for the skin- so very soothing for eczema. Infuse Chickweed in olive oil and mix with a small amount of pure bee’s wax and a few drops of Lavender or Spearmint Essential oil to make Chickweed salve. Crimson Clover is so beautiful here in Alabama in early spring! ​Garlic Grass I sure get hungry for salad while mowing grass for the first time in spring due to the prolific tufting of this Herb underfoot. Edible and Medicinal Garlic grass- like Garlic cloves- is yummy in soup, "spring greens" salad, and in other cooked dishes. Both the "grass" and the clove root is used. All garlic helps strengthen immunity, and is quite useful for sore throats, earache, and chest congestion. Goldenrod Lofty, tufty, and ethereal Goldenrod paints our landscapes in Autumn. We think that we're allergic to it. However, its neighbor Ragweed- abloom in the same patch- is lofting pollens that get caught in our mucous membranes and cause misery. (see comparison Pic) Actually, Goldenrod is a great respiratory Herb- combating the very symptoms we think it causes! There's nothing quite as soothing as a cup of Goldenrod tea. Horsetail is known in spring for its striped stem emergence which develops the characteristic equine bursts as it matures. 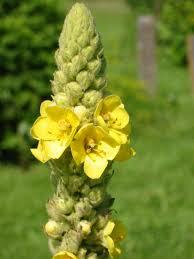 Horsetail contains the highest amount of silica of any herb. Because of its high silica content, Horsetail is often useful in conjunction with Solomon Seal for strengthening the spine and lubricating the articulating spaces between the vertebrae. Kudzu knits us together, doesn’t it? Lush... and covering acres of Alabama, this legume has been used in Chinese Medicine since 200 B.C. We use the blossoms to make jelly and the bees make lovely magenta Kudzu honey. Tender spring leaves can be stuffed with rice and baked. Kudzu root is powdered and used as a thickener. The whole plant is being studied for a variety of medicinal uses. ​When cows escape their confines, they have "Happy Kudzu Parties." Nettles is both our friend, and our enemy. Its stinging quality is offset by its superlative green nourishing qualities. We use to call this “cow itch” when we were children. Believe me, it ruined the day if you ran into a patch without foreknowledge. Nettle leaves are covered with tiny hairs that release a combination of chemicals that sting and burn for hours. Once Nettles have dried or are subjected to heat= No sting! Nettle celebrants gather the plants wearing gloves that cover their whole arms. Young Nettle plants make a delicious cooking green. Nettle soup is famous! Nettles are filled with calcium, Vitamin A, Protein, Iron and Magnesium. Warm Nettle tea is lovely in the evening with honey and a drop of peppermint! Infused Nettle oil can be made into a salve to rub on painful joints; it is anti-inflammatory. Plantain is one of my favorite green Herb weeds. 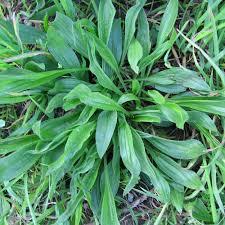 Found in gardens, meadows, and fields Plantain leaves are either broad and elliptical or lance-shaped as shown in the two pics. This is one herb you can use right in the field. Bee sting? Chew a Plantain leaf and place the chewed “spit poultice” right on the sting. This is an old remedy that works almost instantly. Infused Plantain oil can be combined with Chickweed oil and Lavender essential oil to be used for bites, cuts, stings, scrapes and burns. 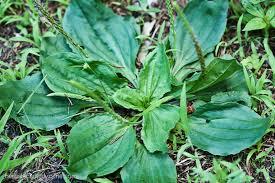 Internally Plantain is useful for soothing mucous membranes of the respiratory and digestive tract. 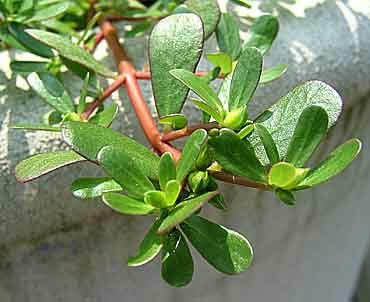 Purslane (pigweed) is a great “pot herb.” Like Nettles, Purslane is nutritionally lush. Exceptionally rich in antioxidants and immune system builders, Purslane can be grown in the garden and eaten as a vegetable- like spinach. It is a great source of Omega 3 fatty acids, potassium and magnesium. Solomon Seal Found in the shade, Solomon Seal's blossoms resembles a row of teeth..
​ Its name is derived from the appearance of the root junctions- which resemble seals used for stamping documents. Solomon Seal root is used in tincture to moisten and nourish- for joints, ligaments, and tendons, as well as for mucous and serous membranes. Continued use can dissolve bone spurs. Violet Precious flower of Victorian times still graces our landscapes in springtime. Violet blossoms in Honey known as "Sweet Aunt Vi" is so helpful for that scratchy sore throat! Violet leaf and flower can be consumed as a food safely for children and elders, too. Blossoms can be sprinkled in salads and as a garnish. Tea from flower and leaf is especially helpful for lymph movement and drainage- which in turn cleanses the blood. Violet acts as an anti-inflammatory; it is a useful application in a poultice or salve to treat bites, abrasions, and itchy patches. 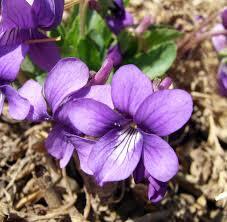 Violets astringent quality helps make salve soothing to both hemorrhoids and vericose veins of the legs and feet. 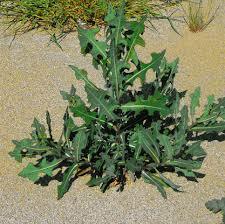 Although this plant contains no opiates; it is also known as "Opium Lettuce" and is legal form of analgesia. It does not produce Central Nervous System dullness. 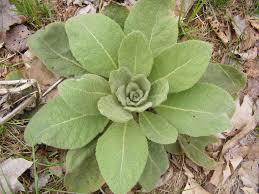 Wild Lettuce is said to be helpful during migraine and for pain during menses. Its light sedative effect aids sleep. 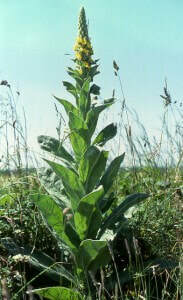 Wild Lettuce is useful in conjunction with Mullein and Marshmallow for respiratory congestion. After reading this, I hope you carry a basket during your walks. You’ll never know just how many Herbs you may see Underfoot! Remember... there are "seasons" of growth and ripening as well as harvesting for Herbs Underfoot just as there are for garden plants, vegetables and fruits. Most of the Herbs mentioned in this article are seen in Springtime. Seasons change and other helpful Herbs Underfoot appear. Please subscribe to our Newsletter or comment on this article here.